Former Villanova All-American Douma-Hussar of Cambridge, Ontario is generally known as a 1500 meter specialist. Her accomplishments at that distance include two Canadian national titles, an IAAF World Indoor Championships silver in 2004, and an Olympic finals in 2004 in Athens. She's won New York's 5th Avenue Mile twice as well. In her first Canadian road race, Carmen Douma-Hussar showcased her versatility and sheer dominance, winning the women's 10K at the Oasis ZooRun in 33:23, Saturday in Toronto. In the process she took the Canadian 10K title. “It's a first [road race win], and it's a fun thing to win a Canadian championship,” Douma-Hussar said modestly, as she was whisked away to doping control. The race, which also served as the Athletics Canada national 10K championships, attracted some of the top runners from across the country. It's also the finale of the Canada Running Series and Timex Series events. British Columbia won the Timex team challenge. Defending champion Malindi Elmore of Kelowna, B.C., finished in second place, almost a minute back of Douma-Hussar in 34:12. Lanni Marchant of London, Ont. was third in 34:40. Although she won her fourth Canadian crown by a large margin, it was a big challenge for Douma-Hussar, who admits she's much more comfortable on a 400m synthetic track than a hilly course that winds through the Toronto Zoo. But she took advantage of a key difference in the sport. In most road races, unlike track or cross country, women and men run on the course at the same time. “You're running with the guys. It can help. You can focus on the next guy in front of you, if there are not too many women around you,” Douma-Hussar said. Douma-Hussar had built a 17-second lead on Elmore at the halfway mark, splitting 5K in 16:30. She consistently increased the gap, before showing off her fast-twitch skills in a sprint down the finishing stretch to break the ceremonial tape. 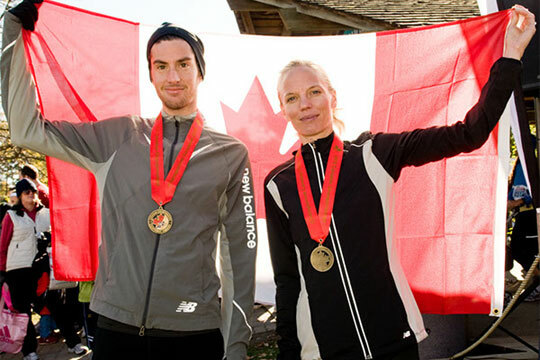 Douma-Hussar and Elmore — both elite 1500m runners on the track — won the last two Canadian 10K road titles. It may be the start of a trend, where more middle-distance athletes look seriously at making the jump to long-distance road racing sooner in their careers.